Share the post "Monarda Didyma Or Beebalm: Gardening Tips & Uses"
Monarda didyma or Scarlet monarda (see more common names below), is an aromatic herb, native to eastern North America from Maine west to Ontario and Minnesota, and south to northern Georgia. It is naturalized further west in the United States and also in parts of Europe and Asia. Beebalm fragrance is considered very similar to that of the bergamot orange (read about it here >>> What is in your Earl Grey Tea? ), so leaves are used to make a refreshing tea. The fragrances of different species and cultivars may resemble lavender, lavender-eucalyptus, Greek oregano, thyme, lemon, or other combinations. Beebalm has ragged, bright red tubular flowers, borne on showy heads of about 30 together, with reddish bracts – a heaven for the bees, butterflies and hummers. Later on flowers turn brown and produce tiny, inconspicuous fruits. This classic eastern North American wildflower grows in dense clusters along stream banks, moist soils in rich woods, thickets and ditches. Monarda is a versatile plant and a longtime garden favorite. It is extensively grown as an ornamental plant due to its beautiful blooms, which also has a wonderful fragrance and medicinal properties. The entire plant above ground is edible. Family: Lamiaceae – the same plant group that includes mints, rosemary, lavender, and many other plants with valuable aromatic, even pungent, essential oils. Cultivars: ‘Bowman’ (purple flowers), ‘Granite Pink’ and ‘Pink Delight’ are dwarf (pink flowers), ‘Alba’ (white flowers), ‘Cambridge Scarlet’ and ‘Jacob Kline’ (crimson flowers), ‘Violet Queen’ (violet-purple flowers), ‘Jacob Kline’, ‘Gardenview Scarlet’, ‘Scorpio’ are mildew resistant. Moisture: Average Water Needs. Moderate to well-drained. Prefers moist soil. • From seed; sow in a cold frame ; plant seedlings into their permanent positions in early summer or sow seeds in situ in late summer. • From cuttings of soft basal shoots in spring. Get the shoots (about 8 – 10 cm (3 – 4 in) above the ground) with plenty of underground stem. Pot them up first until they are rooting well. Keep them in light shade in a cold frame or greenhouse . Plant them out in the summer. • By division in spring or autumn. Plant out large divisions direct into their permanent positions. Smaller divisions better to grow first in light shade in a cold frame until they are well established. Plant them out in late spring or early summer. Beebalm has a long history of use as a medicinal plant by many Native Americans, including the Blackfeet. The Blackfeet Indians used poultices of the plant for skin infections and minor wounds (as antiseptic). An herbal tea made from the plant was also used to treat mouth and throat infections caused by dental caries and gingivitis. Beebalm is the natural source of the antiseptic thymol (concentrated primarily in the leaves and blooms), the primary active ingredient in modern commercial mouthwash formulas. Beebalm is often used in the treatment of digestive disorders. The leaves and flowering stems are anthelmintic, carminative, diuretic, expectorant, febrifuge, rubefacient and stimulant. An infusion is used in the treatment of flatulent colic and sickness, or as a diuretic to treat urinary disorders. The leaves can be harvested separately or with the flowering stems and can be used fresh or dried. An essential oil from the herb is mainly used externally as a rubefacient in the treatment of rheumatism. Essential oil, used in perfumery, as a hair tonic. The dried leaves and flowers are used to scent and add color to pot-pourri. Edible: Flowers, Leaves. Leaves and young shoot tips are eaten raw or cooked, used as a flavoring in salads, fruit salads, or drinks. Flowers are eaten raw, can be added to salads. An excellent aromatic tea is made from the fresh or dried leaves and flower heads. • Monarda spreads quickly and requires division every two years or so. Deadhead to extend bloom time and prevent self-sowing. • Plants are subject to mildew in dry summers, so allow good air circulation around Bee Balm plants to avoid it, or choose mildew resistant cultivars. • Beebalm is said to improve the growth and flavor of tomatoes. It is also recommended with the coneflower. • Beebalm dies to the ground in winter and comes back in spring. 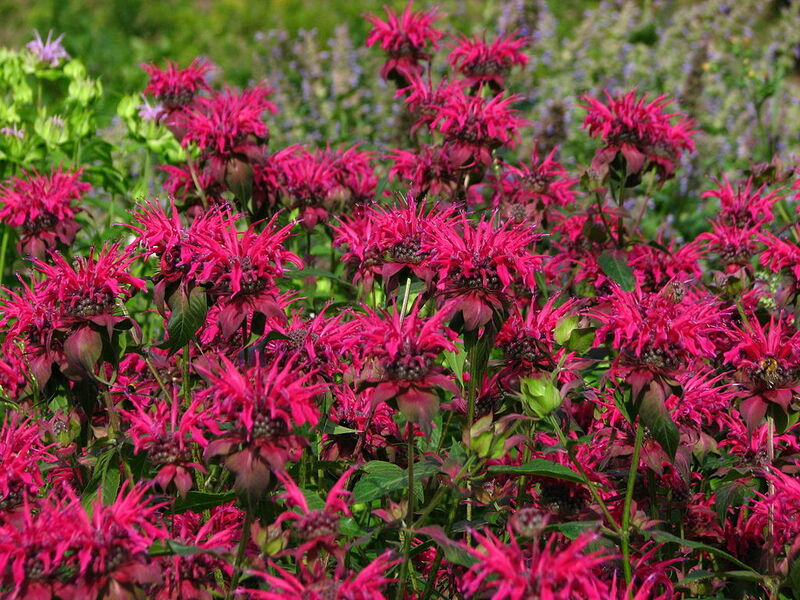 Do you grow Monarda didyma (Beebalm) in your garden? What is your experience with this plant? Please share with other fellow gardeners in the comments below! Do you sell Monarda didyma (Beebalm) seeds or have plants for sale? You can place your advertisement here. Contact us now!